Offering separate prices in different stores (multistore or microstore). A common scenario is offering separate prices to wholesale and retail customers (for example giving wholesale 10% off retail prices). This article is a step-by-step guide to setting that up. After saving, the price calculator rules will be available at the bottom of the Edit Price Calculator Screen. For more information, see: What is Regex? 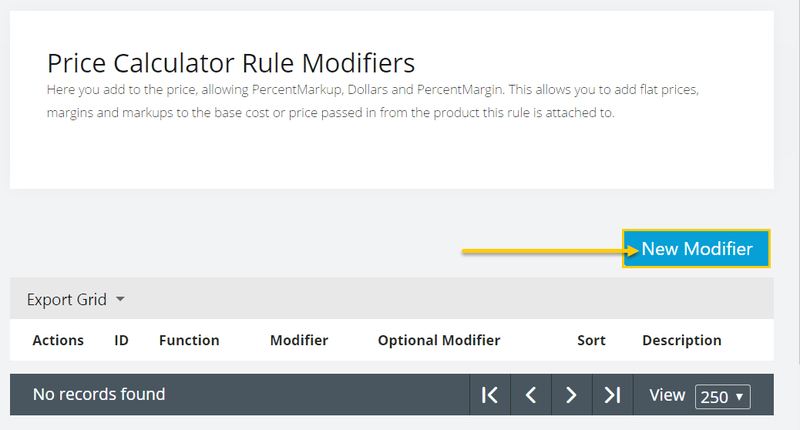 Once you click save, the Price Calculator Rule Modifiers will be available at the bottom of the Edit Price Calculator Rule Screen. Set Modify Price By to "adding negative 10%"
What is a rule modifier? The price calculator rule modifier is where the price markup is set. This can be base on a percent or a flat amount. Additionally, negative numbers can be used to create a discount, instead of a markup. Calculator Name: The name of the price calculator. This is not displayed to the customer. Description: Optional field for adding explanation of what the calculator does. Applies to item numbers: Takes regex (Regular Expressions). Use ". *" to match all item numbers. Item numbers can be specified by separating them by pipe symbols like so: ITEMA|ITEMB|ITEMC. 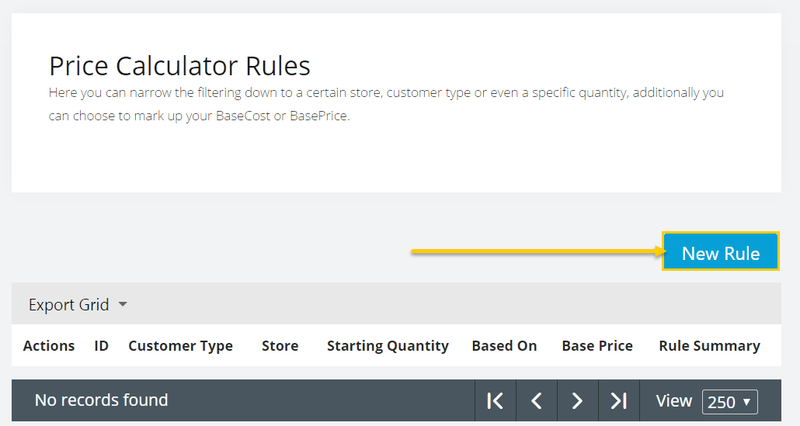 Price Calculator Rule: allow you to narrow the filtering down to a certain store, customer type or even a specific quantity, additionally you can choose to mark up your Base Cost or Base Price. Applies to Customer Type: If selected, the prices will only be available to this customer type. Applies to Store: If selected, the prices will only be available on this selected store front. Starting Quantity: The quantity of the item that must be in the cart for the customer to receive the price. Price based on: Chose what the new price will be based off of: Base Cost, Base Price, Specified Base price. If you're unsure what to use, select Base Price. Modify Price By: The dollar amount to add or subtract. Use negative numbers to subtract. Sort Order: The order that the calculator rule is applied to the product in relation to other calculator rules. Lower sorts get priority. this image under "How to setup a pricing calculator" is missing stuff from that list. Found what I needed under Power Features... and even then that list fails me with no search and any save or change I make I get returned to the top of the list and not returend to my entry point for editing the next item. Thanks for bringing this to our attention. I'm in the process of updating this article. Take a look at the article now! I've made lots of improvements to it. Let me know if you still think something needs to be clarified. Price Claculator needs a Search Fuction! Price Calculator should not go back to Page 1 when you edit an entry and save it. Price calculator failure... I need to discount something at a quantity level that is discount -.017, while your website lets me enter in this value... but as soon as you save this rule the saved screen shows the modifier rounded up to the next whole value .02 and functions at .02 and not the value I provided. SO..why even give us a form that can accept additional digits when all your website is going to do it round this up??? Advanced pricing will give you the precision you need.